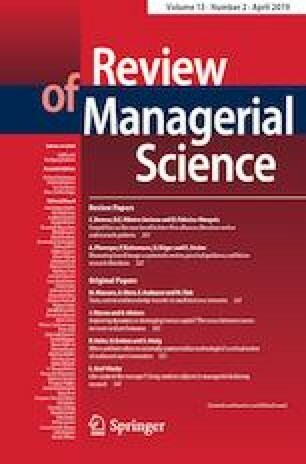 Managerial debiasing studies are rare because it is often challenging to obtain manager samples to perform the required experiments. Student subjects could mitigate this difficulty, but there is widespread uncertainty regarding their implications for a study’s validity. In this paper, I first trace the debate, and structure the literature, on the use of student subjects in business research in general. Next, I propose a conceptual framework of criteria to identify under which circumstances student subjects can be valid surrogates in managerial debiasing research. Finally, I illustrate the use of the framework by repeating an extant debiasing study conducted with management practitioners with a large sample of business students (N = 1423), showing that the student sample replicates the results from the manager sample to the expected degree. I close by discussing the study’s implications, limitations, and opportunities for future research. The author would like to acknowledge helpful comments from Editor-in-Chief Wolfgang Kürsten and two anonymous reviewers that shaped and improved the paper. Andreas König, Harald Hungenberg, Albrecht Enders, Jan Nopper, Sebastian Kreft, Andreas Fügener, Jan Krämer, Philip Meissner, as well as the participants of the 15th Annual Conference of the European Academy of Management in Warsaw and the 75th Annual Meeting of the Academy of Management in Vancouver also contributed valuable insights to this manuscript. Furthermore, Björn Baltzer, Christian Landau, and the local chapter chairpersons of Marketing zwischen Theorie und Praxis (MTP) e.V. greatly supported the data collection effort.